Quick kid approved dinner alert! When my husband and I were newlyweds, without a lot of money I used to make him this dinner all the time. Using all pantry ingredients this comes together in 5 minutes. I use my same method as when packing lunches, by taking something my kids already like and tweaking it ever so slightly. 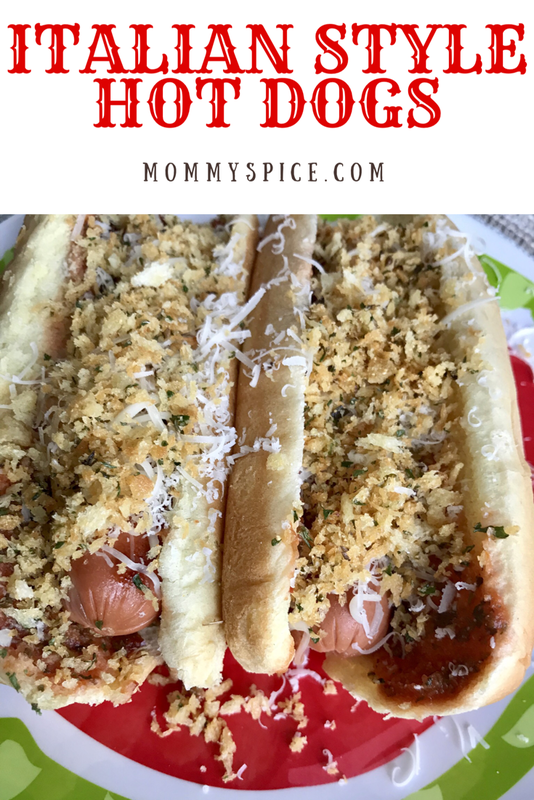 If you are looking to make this a more filling dinner, pair the hot dogs with some frozen ravioli and veggies and voila, dinner done. 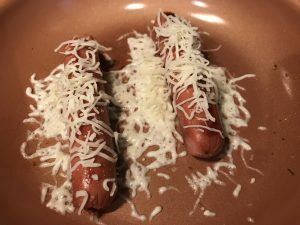 Cook your hot dogs to desired done-ness, while the frying pan is still hot place a healthy pinch of mozzarella cheese on top to melt. 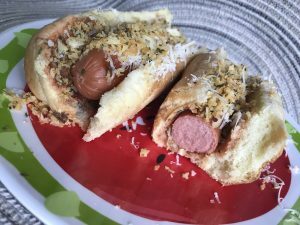 While the cheese melts, warm marinara sauce, then spoon on to each side of your hot dog bun. 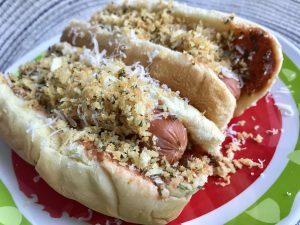 Place your cheesy hot dogs into the sauce covered buns, top with parmesan and bread crumbs. Eat immediately. If you choose to toast your bread crumbs, you’re looking for a light brown color like this, then you’ll know they’re done. Don’t skip on melting that mozzarella, the gooey cheese really brings this hot dinner together. This dinner is great in a rush, if work runs late or your kid has an extracurricular activity during the week. Both frozen ravioli or a freezer steam bag of veggies will only take 5 minutes to cook, and you’re already warming up marinara sauce, so you’re still talking 10-12 minutes to have a warm dinner on the table. 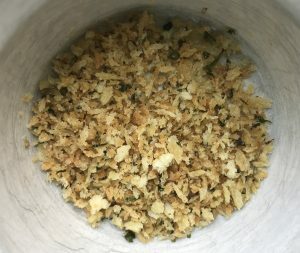 My tip for this one is if you do have extra time, toast your bread crumbs with a drizzle of olive oil in a frying pan until they are light brown in color. This will give them even more crunch, and don’t be afraid to add your toasted bread crumbs to the top of your pasta and veggies, the flavor and crunch is amazing. Now if you truly want to make this Italian, ditch the hot dogs and go for a spicy sausage instead.